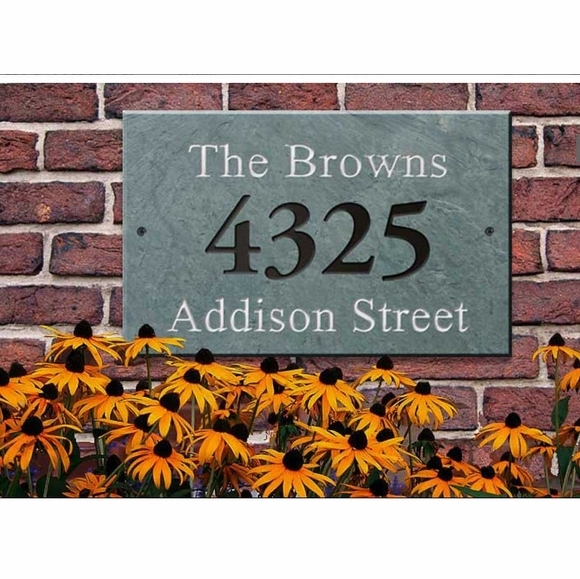 Large Slate Address Plaque - - 19"W x 12"H. Wall mount. Made in USA. This custom made slate sign features the house number in the center of the sign with one line of personalized text at the top and bottom. Top line holds up to fifteen (15) characters (in upper and lower case letters as shown). House number line holds up to four (4) digits. Bottom line holds up to fifteen (15) characters (in upper and lower case letters as shown). Color combinations: green with white text and black numbers and green with print text and black numbers. Note: also available with a design instead of house number (see Related Products). Ready for wall mount with a hole near each short edge.